Burners crash everywhere, so don’t worry about being bothered or deliberately woken up. In 2007, I spent quite a bit of time at the Black Rock City Library and there were people sleeping all over the floor. Other Burners just stepped right over them. You can also sleep on or around random art on the Playa, but I recommend getting your sleep in the City. You will be closer to the camps that serve food and drink, and you will be more protected from the sun, cold and dust. If you do end up sleeping in random places, bring a small pillow, a blanket or warm coat, and earplugs. According to the Burning Man website, you are not really allowed to show up at the gate without all your own supplies, including your bed. As the heart of Black Rock City, Center Camp is the central meeting place for all Burners. Musicians, speakers, acrobats and dancers infiltrate the stages of Center Camp and keep up the lively atmosphere 24 hours a day. The lines for the coffee and tea are long, the lighting is bright and the vibe is dynamic. You will have to be a deep sleeper to crash here. The massive, clam-shaped dome of the Skinny Kitty camp is a great place to hide from the dust storms. The Teahouse usually has a plethora of couches (some screened from view) in the back of their beautiful shelter. You can wake up from your nap with a nice cup of their hot or iced tea. The Teahouse sometimes features singers and low-key musicians who perform on the large stage, so you could be woken up by a melodic guitar or by a woman who sings just like Ella Fitzgerald. It’s amazing how well you can sleep in a hammock when you are dead tired. 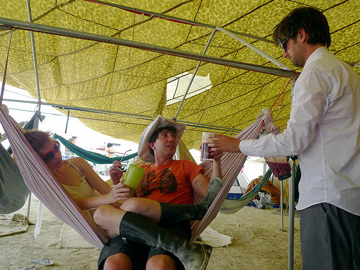 Catch some shade under Hammock Hangout’s giant parachute tent. Hammocks are available for naps or you can bring your own, but know that the camp is also a karaoke bar at night. Cons: You have to win their “win a room” lottery. This camp is the epitome of class and elegance in Black Rock City. Each night leading up to the Burn, the organizers of the Ashram Galactica Hotel put on a posh dinner and cocktail party with a British Raj theme. At the party, guests are entered into a lottery to win a room for their use for 24 hours. The “rooms” are swanky, canvas tents with soft beds, room service and electric fans. This is the place to live it up in Black Rock City. Cons: You may be in the way of a yoga or meditation group. Looking to get some sleep and a back massage? 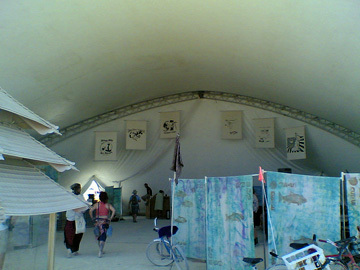 Heebeegeebee Healers has one of the biggest tents in Black Rock City. One of the best naps I ever had at Burning Man was under the multi-colored sheets of this camp. You can sign up for a back massage from their professional healers, join in on a yoga session, or just curl up in a corner of their carpet and pass out. MatadorNetwork’s Burning Man focus page brings you news from MatadorTV, tips ,and tales from the Playa. Feast your eyes on video to get you geared up or submit your own.